The ReSpeaker Mic Array v2.0 is an upgrade to the original ReSpeaker Mic Array v1.0. 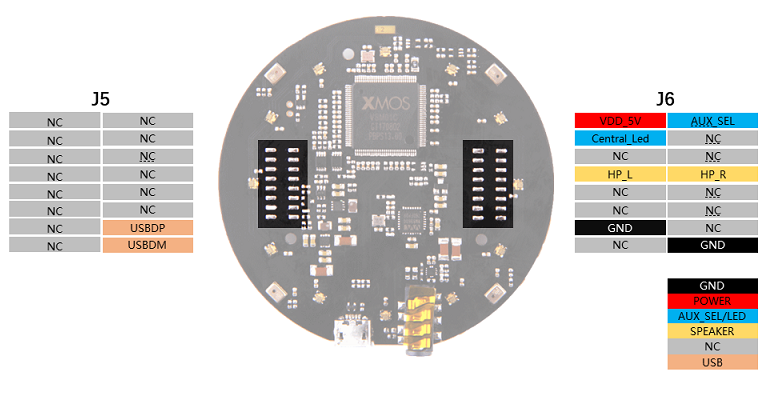 This upgraded version is based on XMOS’s XVF-3000, a significantly higher performing chipset than the previously used XVSM-2000. This new chipset includes many voice recognition algorithms to assist in performance. The array can be stacked (connected) right onto the top of the original ReSpeaker Core to significantly improve the voice interaction performance.The microphones have also been improved in this version allowing significant performance improvements over the first generation mic array with only 4 microphones. The ReSpeaker Mic Array v2.0 supports USB Audio Class 1.0 (UAC 1.0) directly. All major Operating System, including Windows,macOS, and Linux are compatible with UAC 1.0, allowing the mic array to function as a sound card without the ReSpeaker Core,while also retaining voice algorithms, such as DoA, BF, and AEC on those systems. The ReSpeaker Mic Array v2.0 is a great solution for those who wish to add voice interface into their existing products or future products. It also works well as an entry point to higher level voice interface evaluation. The board allows some flexibility for customization upon request. The ReSpeaker Mic Array v2.0 has two firmware versions available, one including speech algorithms and a second for raw voice data. 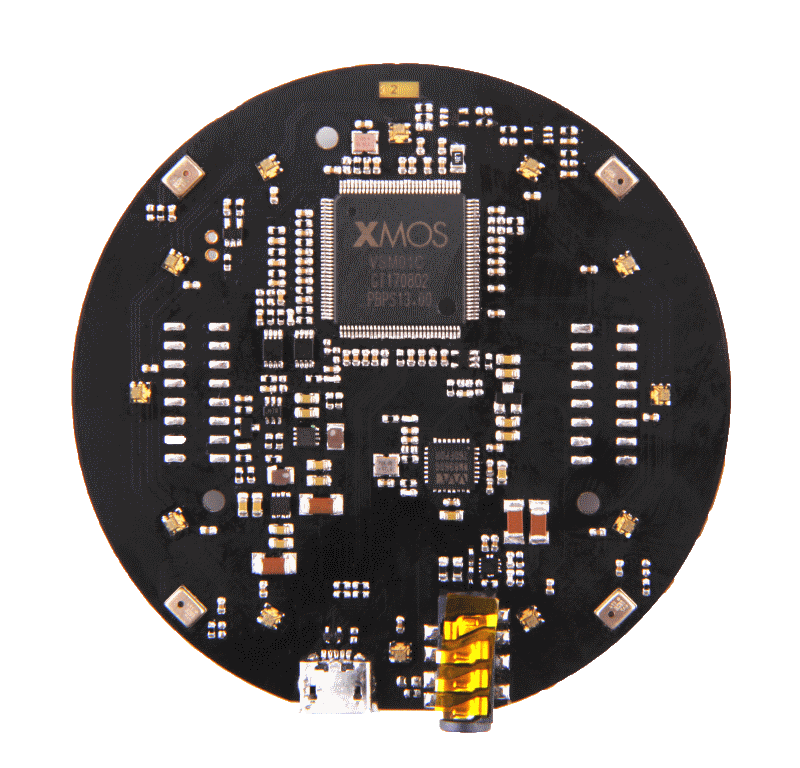 ① XMOS XVF-3000: It integrates advanced DSP algorithms that include Acoustic Echo Cancellation (AEC), beamforming, dereverberation, noise suppression and gain control. ② Digital Microphone: The MP34DT01-M is an ultra-compact, lowpower, omnidirectional, digital MEMS microphone built with a capacitive sensing element and an IC interface. ③ RGB LED: Three-color RGB LED. ④ USB Port: Provide the power and control the mic array. ⑤ 3.5mm Headphone jack: Output audio, We can plug active speakers or Headphones into this port. ⑥ WM8960: The WM8960 is a low power stereo codec featuring Class D speaker drivers to provide 1 W per channel into 8 W loads. 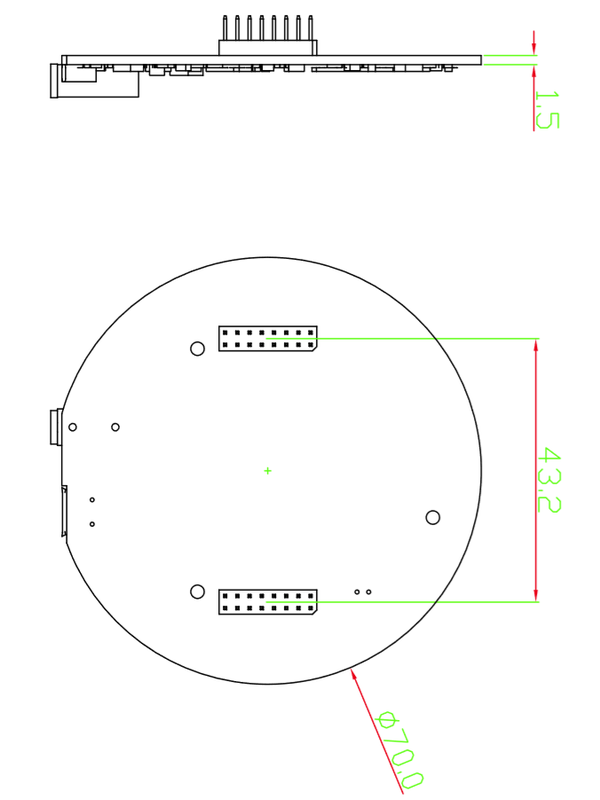 ReSpeaker Mic Array v2.0 is compatiable with Windows, Mac, Linux systems andriod. The below scripts are tested on Python2.7. 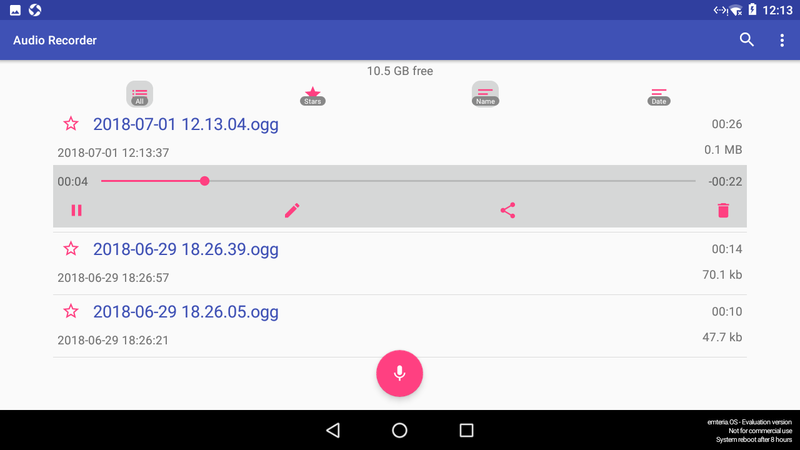 For andriod, we tested it with emteria.OS(andriod 7.1) on Raspberry. We plug the mic array v2.0 to raspberry pi USB port and select the ReSpeaker mic array v2.0 as audio device. Here is the audio recording screen. Here is the audio playing screen. We plug speaker to ReSpeaker mic array v2.0 3.5mm audio jack and hear what we record. There are 2 firmwares. One includes 1 channel data, while the other inlcudes 6 channels data (factory firmware). Here is the table for the differences. 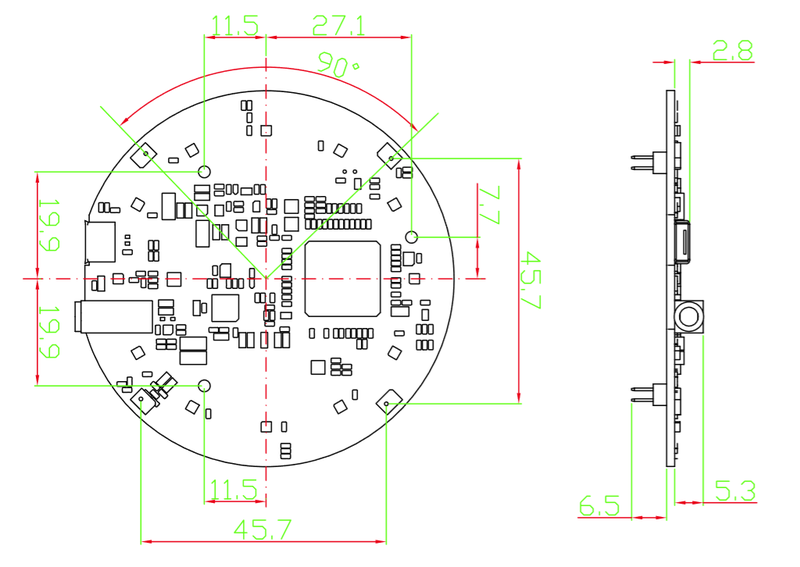 For Linux: The Mic array supports the USB DFU. We develop a python script dfu.py to update the firmware through USB. Here is the firmware downloading result. For Windows/Mac: We do not suggest use Windows/Mac and Linux vitual machine to update the firmware. Here is the Acoustic Echo Cancellation example with 6 channels firmware. Step 1. Connect the USB cable to PC and audio jack to speaker. Step 2. Select the mic array v2.0 as output device in PC side. Step 3. Start the audacity to record. Step 4. Play music at PC side first and then we talk. Step 5. We will see the audacity screen as below, Please click Solo to hear each channel audio. Here is the video about the DOA and AEC. Windows: Audio recording and playback works well by default. Libusb-win32 driver is only required to control LEDs an DSP parameters on Windows. 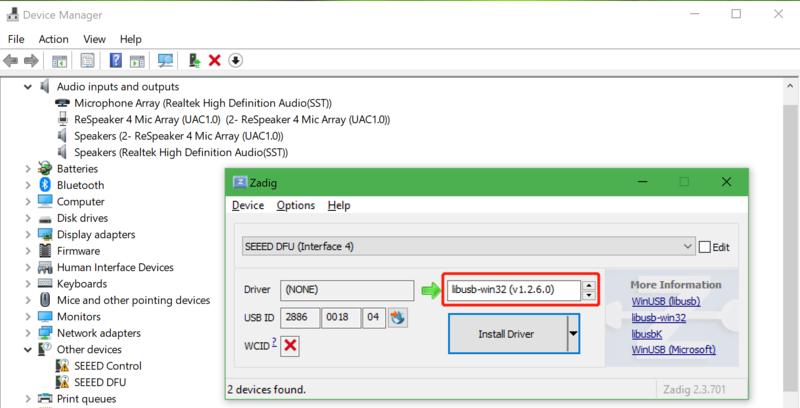 We use a handy tool - Zadig to install the libusb-win32 driver for both SEEED DFU and SEEED Control (ReSpeaker Mic Array has 2 devices on Windows Device Manager). Please make sure that libusb-win32 is selected, not WinUSB or libusbK. MAC: No driver is required. Linux: No driver is required. For Linux/Mac/Windows: We can configure some parameters of built-in algorithms. Get the full list parameters, for more info, please refer to FAQ. Example#2, We can check the DOA angle. We can control the ReSpeaker Mic Array V2's LEDs through USB. The USB device has a Vendor Specific Class Interface which can be used to send data through USB Control Transfer. We refer pyusb python library and come out the usb_pixel_ring python library. Here are the usb_pixel_ring APIs. For Linux: Here is the example to control the leds. Please follow below commands to run the demo. Here is the code of the usb_mic_array.py. For Windows/Mac: Here is the example to control the leds. If you see "None" printed on screen, please reinstall the libusb-win32 driver. For Windows/Mac/Linux: Here is the example to view the DOA. The Green LED is the indicator of the voice direction. For the angle, please refer to hardware overview. Step 1. Download the usb_4_mic_array. Step 3. We will see the DOA as below. For Windows/Mac/Linux: Here is the example to view the VAD. The Red LED is the indicator of the VAD. For the threshold of VAD, we also can use the GAMMAVAD_SR to set. Please refer to Tuning for more detail. 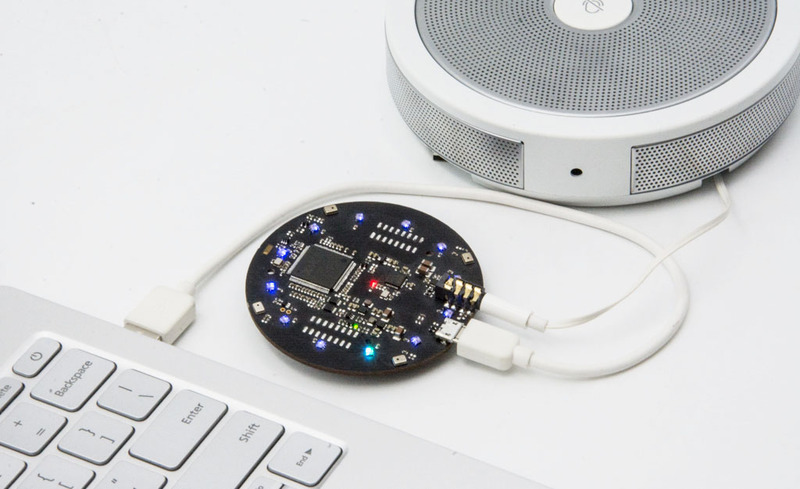 We use PyAudio python library to extract voice through USB. 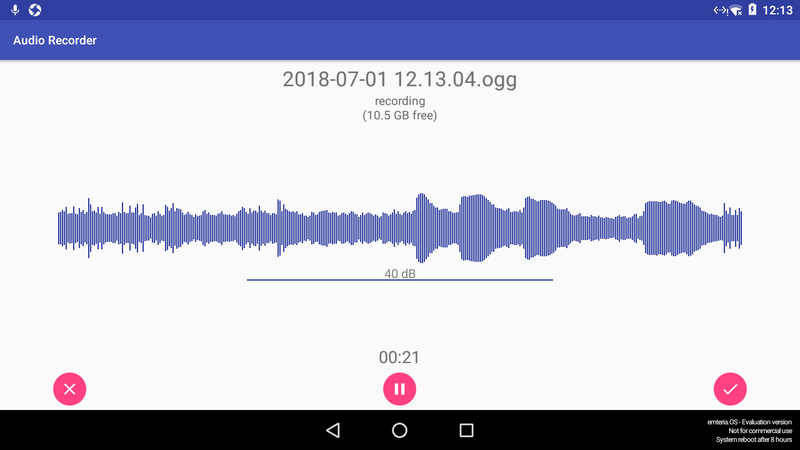 For Linux: We can use below commands to record or play the voice. We also can use python script to extract voice. Step 2, copy below code and paste on get_index.py. Step 3, press Ctrl + X to exit and press Y to save. Step 4, run 'sudo python get_index.py' and we will see the device ID as below. Step 5, change RESPEAKER_INDEX = 2 to index number. Run python script record.py to record a speech. Step 6. If you want to extract channel 0 data from 6 channels, please follow below code. For other channel X, please change [0::6] to [X::6]. Step 1. We run below command to install pyaudio. Step 2. Use get_index.py to get device index. Step 3. Modify the device index and channels of record.py and then extract voice. If we see "Error: %1 is not a valid Win32 application. ", please install Python Win32 version. 2018-03-24 14:53:02.400 Python[2360:16629] 14:53:02.399 WARNING:  140: This application, or a library it uses, is using the deprecated Carbon Component Manager for hosting Audio Units. Support for this will be removed in a future release. Also, this makes the host incompatible with version 3 audio units. Please transition to the API's in AudioComponent.h. ODAS stands for Open embeddeD Audition System. This is a library dedicated to perform sound source localization, tracking, separation and post-filtering. Let's have a fun with it. Step 1. Get ODAS and build it. Step 2. Get ODAS Studio and open it. Step 3. The odascore will be at odas/bin/odaslive, the config file is odas.cfg. Step 4. Upgrade mic array with 6_channels_firmware.bin which includes 4 channels raw audio data. For Windows/Mac: Please refer to ODAS. AECFREEZEONOFF      int 1   0   rw  Adaptive Echo Canceler updates inhibit. AECPATHCHANGE       int 1   0   ro  AEC Path Change Detection. AECSILENCEMODE      int 1   0   ro  AEC far-end silence detection status. AGCDESIREDLEVEL     float   0.99    1e-08   rw  Target power level of the output signal. AGCGAIN             float   1000    1   rw  Current AGC gain factor. AGCMAXGAIN          float   1000    1   rw  Maximum AGC gain factor. AGCONOFF            int 1   0   rw  Automatic Gain Control. AGCTIME             float   1   0.1 rw  Ramps-up / down time-constant in seconds. CNIONOFF            int 1   0   rw  Comfort Noise Insertion. DOAANGLE            int 359 0   ro  DOA angle. Current value. Orientation depends on build configuration. ECHOONOFF           int 1   0   rw  Echo suppression. FREEZEONOFF         int 1   0   rw  Adaptive beamformer updates. FSBPATHCHANGE       int 1   0   ro  FSB Path Change Detection. FSBUPDATED          int 1   0   ro  FSB Update Decision. GAMMAVAD_SR         float   1000    0   rw  Set the threshold for voice activity detection. GAMMA_NN_SR         float   3   0   rw  Over-subtraction factor of non-stationary noise for ASR. GAMMA_NS_SR         float   3   0   rw  Over-subtraction factor of stationary noise for ASR. HPFONOFF            int 3   0   rw  High-pass Filter on microphone signals. MIN_NN              float   1   0   rw  Gain-floor for non-stationary noise suppression. MIN_NN_SR           float   1   0   rw  Gain-floor for non-stationary noise suppression for ASR. MIN_NS              float   1   0   rw  Gain-floor for stationary noise suppression. MIN_NS_SR           float   1   0   rw  Gain-floor for stationary noise suppression for ASR. NLAEC_MODE          int 2   0   rw  Non-Linear AEC training mode. NLATTENONOFF        int 1   0   rw  Non-Linear echo attenuation. NONSTATNOISEONOFF   int 1   0   rw  Non-stationary noise suppression. NONSTATNOISEONOFF_SR    int 1   0   rw  Non-stationary noise suppression for ASR. SPEECHDETECTED      int 1   0   ro  Speech detection status. STATNOISEONOFF      int 1   0   rw  Stationary noise suppression. STATNOISEONOFF_SR   int 1   0   rw  Stationary noise suppression for ASR. TRANSIENTONOFF      int 1   0   rw  Transient echo suppression. VOICEACTIVITY       int 1   0   ro  VAD voice activity status. A2: Run sudo pip install pyusb to install the pyusb. Q3: Do you have the example for Raspberry alexa application? 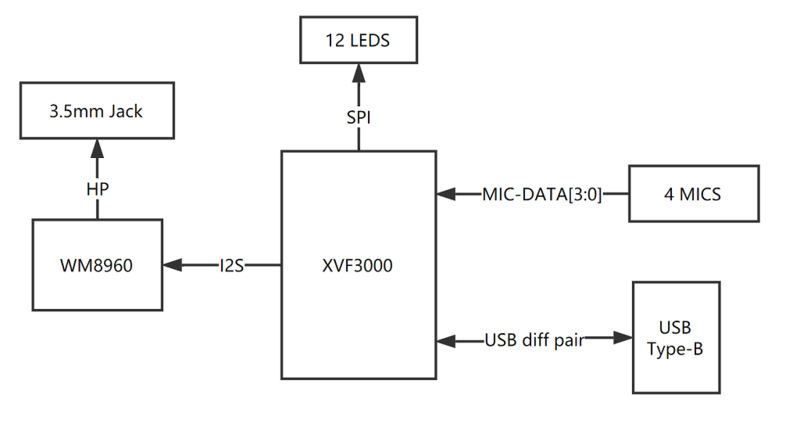 A3: Yes, we can connect the mic array v2.0 to raspberry usb port and follow Raspberry Pi Quick Start Guide with Script to do the voice interaction with alexa. Q4: Do you have the example for Mic array v2.0 with ROS system? A4: Yes, thanks for Yuki sharing the package for integrating ReSpeaker Mic Array v2 with ROS (Robot Operating System) Middleware.